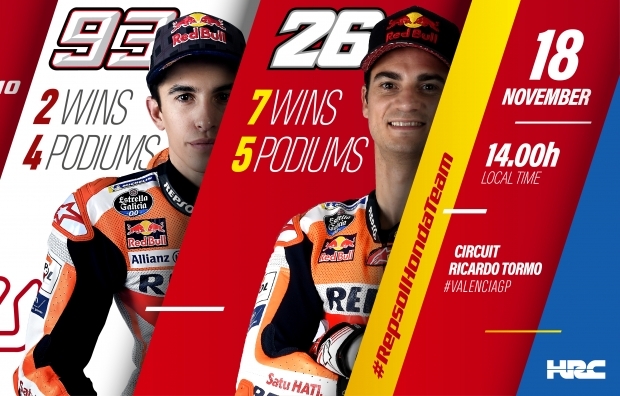 The Gran Premio de la Comunitat Valenciana will be an emotional event for Dani Pedrosa, his numerous fans around the world, and paddock friends in the MotoGP community. The three-time World Champion announced his retirement from racing at the German GP earlier this year, after 18 seasons in Grand Prix racing as a Honda rider. One of the most successful riders of all time, (eighth on the All Time Wins list), Dani will be inducted into the MotoGP Legends Hall of Fame on Thursday in Valencia. Meanwhile, Marc Marquez paid a visit last Tuesday to the Honda stand at the EICMA Show in Milan, Italy, then headed home to Spain to celebrate his seventh World Title with a great party in his hometown of Cervera. 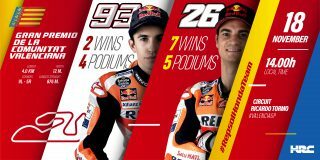 Next Sunday, the squad will try to seal the Team Championship and thereby clinch the MotoGP Triple Crown, having already achieved the Riders Title in Japan and the Constructors Title in Malaysia. The Repsol Honda Team have earned four double-podium finishes at the track where Pedrosa (last year’s winner) is the most successful rider: 2013 (Pedrosa 2nd, Marquez 3rd), 2014 (Marquez 1st, Pedrosa 3rd), 2015 (Marquez 2nd, Pedrosa 3rd) and 2017 (Pedrosa 1st, Marquez 3rd to win that year’s World Title). 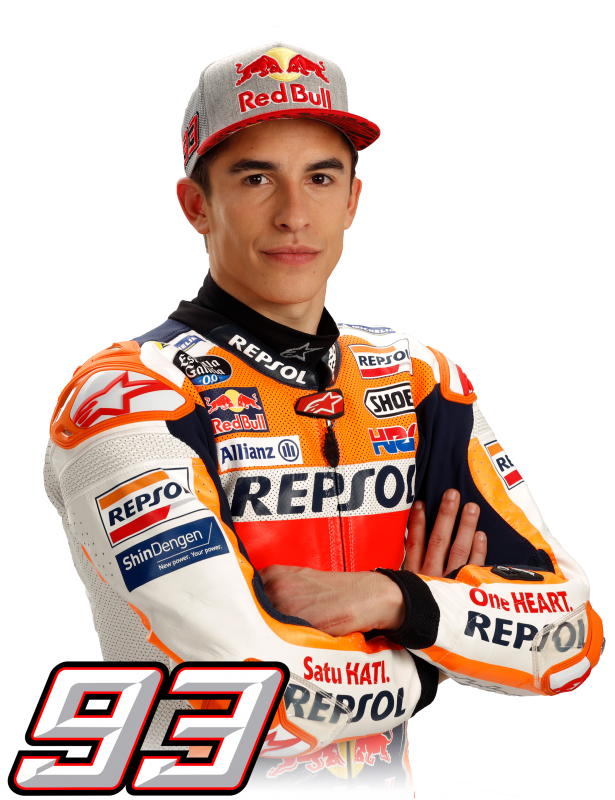 Marc Marquez has 2 wins—1xMoto2 (2012) and 1xMotoGP (2014)—plus 4 podiums and 3 pole positions. 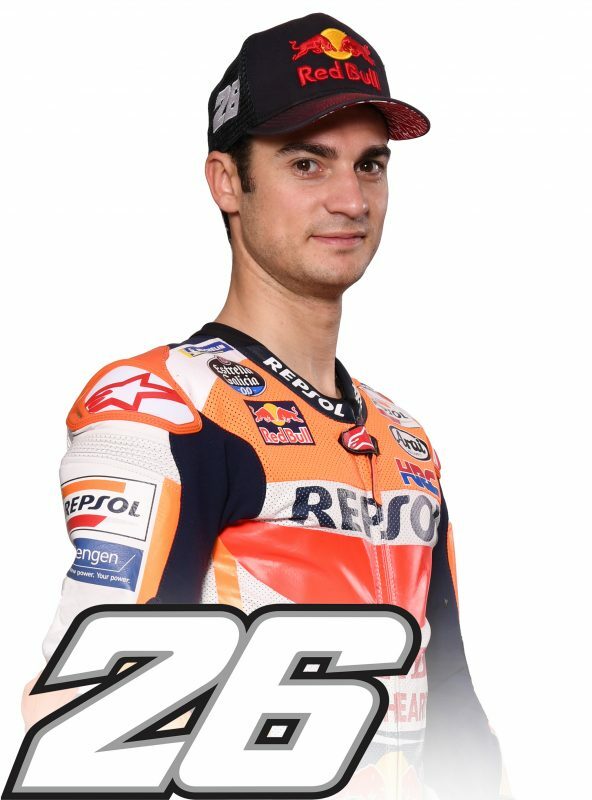 Dani Pedrosa has 7 wins—1×125 (2002), 2×250 (2004, 2005), and 4xMotoGP (2007, 2009, 2012 and 2017), plus an additional 5 podiums and 5 pole positions.